And, I explained the confusion about how to vote on this item - two questions, one answer - if you actually care to vote at all on it. 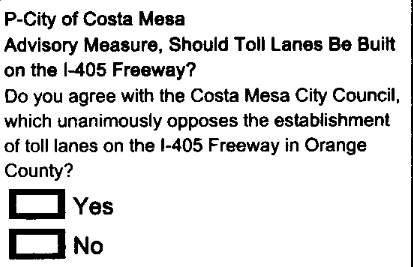 So, if you DO NOT want to see lanes on the I-405 converted to High Occupancy Toll (HOT) lanes, VOTE YES! In a press release from General Manager Scott Carroll today, the Costa Mesa Sanitary District announced the delay in implementation of their new "Organics Recycling" program, originally scheduled to be implemented early next year. 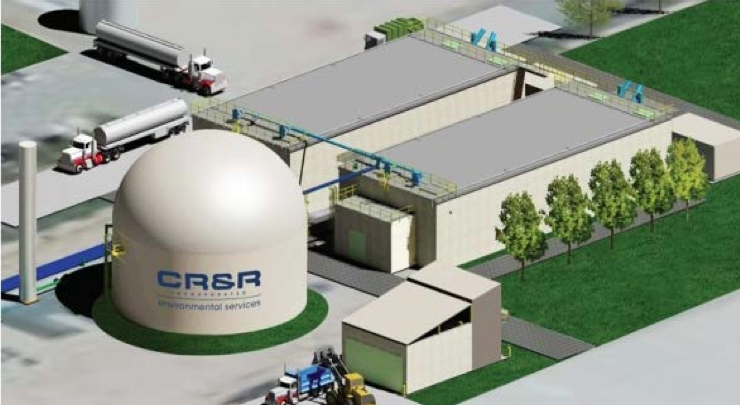 (Costa Mesa, CA) – Costa Mesa Sanitary District (CMSD) officials recently learned that the construction time frame of CR&R’s anaerobic digestion facility in Perris, California has been extended due to the complex nature of the facility. This type of facility has never been constructed in California, so the owner, CR&R Environmental Services, and its contractors are ensuring it is done the right way. “We didn’t want to distribute the organics carts to everyone and then learn that the digester was not constructed properly,” said Jim Ferryman, CMSD Board President. The anaerobic digester is state of the art technology that will convert green waste and food scraps into renewable natural gas. CMSD is the first agency in Southern California to enter into an agreement with CR&R to provide an organics recycling program to its residents. CMSD’s decision to provide an organics recycling program is pertinent now that Governor Brown signed AB 1594 into law which mandates that green waste used as Alternative Daily Cover (ADC) at landfills will no longer receive diversion credits effective January 1, 2020. State law requires local agencies to divert 50 percent of solid waste away from landfills. Many agencies will not meet the 50 percent mandate when ADC is no longer receiving diversion credits unless they find other means for disposing their green waste. Officials believe that CMSD will be able to divert close to 75 percent of its solid waste away from landfills as a result of the organics recycling program. Roll out of the organic carts are expected to begin by the end of June 2015 and will take approximately eight weeks to complete. 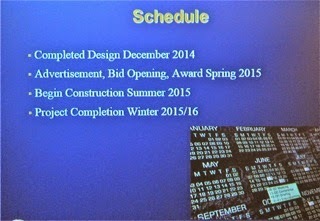 Pictures of the construction of CR&R’s anaerobic digester can be found on the “Media” page of CMSD’s website at www.cmsdca.gov. So, this is a "good news, bad news" story. The good news part is that you don't have to worry about a new method of sorting your rubbish. The bad news is that there has been a delay in the implementation in this state-of-the-art process. Carroll told me that the CMSD is working on more public outreach on this program, which may include a video presentation available to anyone interested as the implementation date draws near. Right now that looks like mid-2015. Last night, at the Halecrest Swim and Tennis Club, the Friends of Costa Mesa Libraries hosted a candidate event that left a good taste in your mouth for a change. This one was designed to present candidates for seats on three Special District boards and give them an opportunity to tell you about themselves and to address issues they felt were important for the positions they are seeking. Just under 50 people attended, counting staff members and relatives of the participants. The special districts represented in this event were the Orange County Water District, Mesa Water District and the Costa Mesa Sanitary District. A total of eight (8) of the nine candidates running for the positions available in these special districts within Costa Mesa were present. Only candidate Chuck Perry failed to show up. Candidates for the Area 7 seat on the Orange County Water District are incumbent and current board president, Shawn Dewane and termed out Costa Mesa City Council member, Wendy Leece. 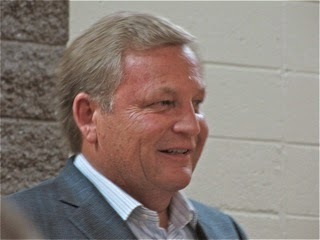 Candidates for the Mesa Water District seat are Ron Amburgey and incumbent Jim Atkinson. Four candidates for the three seats on the Costa Mesa Sanitary District Board are long time incumbents Arlene Schafer, Bob Ooten and Mike Scheafer plus first time candidate Brian Peotter. As I said, Perry failed to show up. 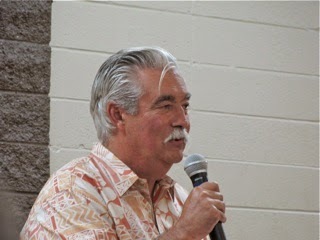 Ooten, in his role as President of the Friends of the Costa Mesa Libraries, gave a brief introduction to some of their members present, defined the organization and it's role with the three libraries in Costa Mesa and presented an award to a long-time employee. 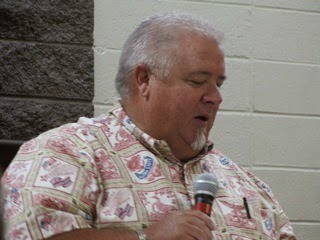 He then turned the meeting over to Mesa Water District Board President Jim Fisler, who acted as moderator. In this case, his role was just to introduce the candidates, since no questions were posed to them. Fisler gave a description of Special Districts and some history. We learned that there are 2,160 special districts in California - 27 in Orange County alone. They cover such things as cemeteries, recreation, police and vector control - and, of course, water and sanitation. He emphasized the value of a tightly-focused board, usually responsible for one or two elements in a community. He also mentioned that they are governed by many of the same rules as are city councils - the Brown Act and Fair Political Practices Commission regulation, for example. Then he announced that each candidate would have seven (7) minutes to introduce themselves and talk about their candidacy. The candidates would appear in the order they appear on the ballot. First up were the two candidates for a seat on the Mesa Water District Board. 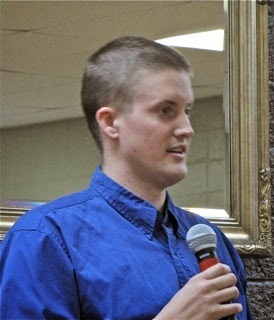 Ron stressed that he's a first-time candidate and that he decided to get involved after attending a meeting of the organization last June at which a rate hike was passed. He spoke against it. He told us he's involved with Costa Mesa United, and that he will probably be elected President next time around. He also told us he was on the board of the Youth Employment Service (YES) since 1987 and has been involved with the Lions Club. He neglected to mention that he was an appointee to both the Charter Committee and the Fairview Park Citizens Advisory Committee. He told us, that although he has many friends on the Mesa Water board, he's "not feelin' the love" - apparently because of his position on the rate increases passed recently. He's a believer in term limits and he doesn't want to get into any negative campaigning. He didn't tell us if he knew anything about water. 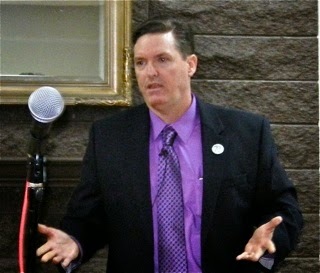 Jim is the incumbent and has been on the Mesa Water Board for 16 years and knows his stuff. 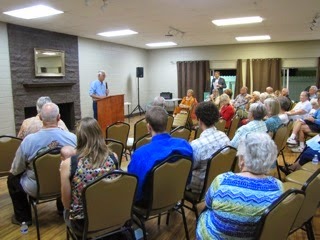 He used his time to give the audience a primer on Mesa, the need for long-term planning and how he was a "ratepayer advocate" who voted NO on the rate increase. He stressed that the biggest cost in delivering water was the cost of electricity used to move it from one place to another. He talked about the 350 miles of pipe, the replacement of which would cost about $1.5 million per mile. He spoke of the 9 wells the District maintains. 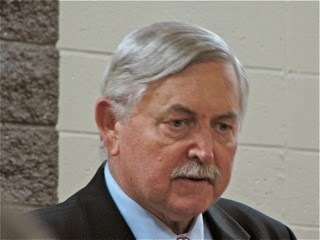 He spoke of the excellent bond rating - AAA, and quoted from a Fitch report that described Mesa Water's performance that justified that high rating. Next came the candidates for the Orange County Water District. 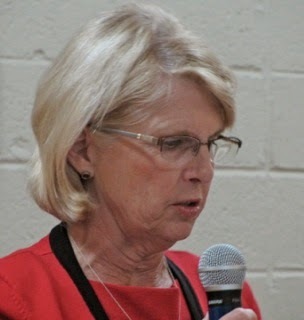 Wendy is a termed-out Costa Mesa City Councilwoman, who has also served on the Parks and Recreation Commission and the Newport-Mesa Unified School District Board of Trustees. She told us she's not a "career politician", then listed all the political positions she's held. I smiled. She told us she has no conflict, unlike her opponent who serves on TWO water boards now. She stressed that she's a hard worker who does her homework and that she works for the residents and ratepayers. She also spoke briefly of the Poseidon desalination project that would apparently run a pipeline across Costa Mesa and cause significant disruption to the lives along it's path. 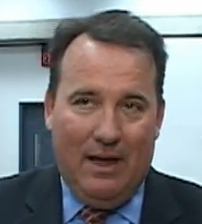 Shawn is currently the President of the Orange County Water District Board and also a member of the Mesa Water District Board. He's a 27 year Costa Mesa resident with a decade serving on the water boards, which he says provides "pure, plentiful and affordable" water. He is a self-described financial expert. He mentioned that twice, in case you missed it the first time. He spoke with authority about his contributions to the water entities in our region, with his ego fully on display. He also mentioned his participation in the creation of the trade organization, CalDesal, which he described as a one-stop-shop for folks interested in desalination projects, and explained it was formed because of the fourteen years and thousands of forms and papers required to get the Poseidon Project to where it is today. 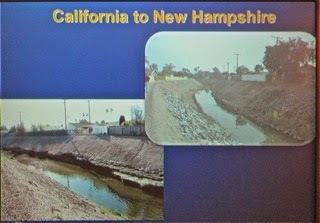 He explained his many trips to Sacramento and Washington, D.C. to work on water issues. He took much of the credit for the excellent condition Mesa Water finds itself in today and beamed with pride when he spoke about the "largest water recycling facility in the world." Next came the candidates for the three seats available for the Costa Mesa Sanitary District. Candidate Chuck Perry was a no-show for this event. Arlene raised a family in Costa Mesa. She has served on the Planning Commission and the City Council, where she was Vice Mayor and Mayor. 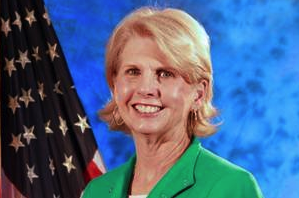 She's a long-time member of the Sanitary District Board and is seeking re-election next month. 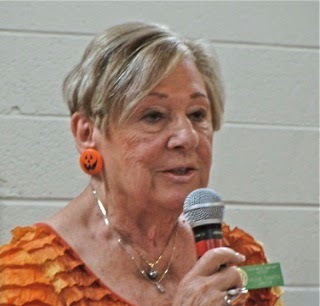 She spoke of her role as a Local Agency Formation Commission (LAFCO) member, and that she had been President of the California Special Districts Association. She spoke briefly of the upcoming Organics Recycling Program. She also spoke of how well the board members get along. Mike is a long-term board member, former Parks and Recreation Commissioner and City Councilman (he didn't mention either of those), long-time member of the Lions Club, President of the Costa Mesa Senior Corporation Board and Chairman of the recent 60th Anniversary Celebration (he didn't mention those, either). He did speak briefly about some of the things he's accomplished while on the board, like using Ipads instead of killing forests to produce staff reports for meetings. He spent a big chunk of his time discussing the upcoming conversion to the Organics Recycling program and the value of doing this inevitable conversion early rather than later. 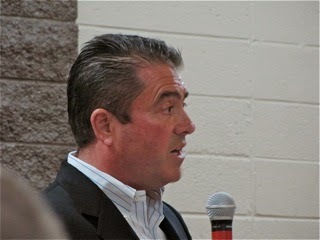 He spoke of the fiscal solvency of the Sanitary District. Brian, a self-described "Rocket Scientist", seemed like a nice enough young fella who just hasn't been alive long enough to understand the job on the Sanitary District Board. In fact, he told us his goal is to eliminate it entirely by folding the Sanitary District into the Water District or The City. He made some not very veiled criticisms of the current board and further demonstrated his lack of knowledge of the inner workings of that organization. It's unclear if he had ever attended a board meeting or not. I'm told not. He ripped a page from the Jim Fitzpatrick song book and spoke of not putting the trash hauling contract out for competitive bidding since the "Eisenhower era". He was hyper-critical of the Organics program, but didn't say anything that demonstrated that he knew much about it. Bob is an double-degreed engineer with more than two decades experience with the Orange County Sanitary District. 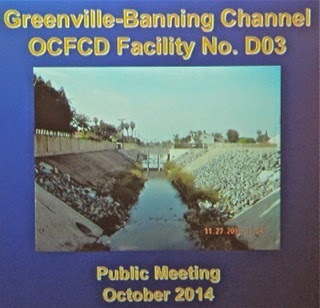 He spoke in detail of the infrastructure of the Costa Mesa Sanitary District and the pro-active steps taken to prepare for disasters and to keep the effluent flowing. 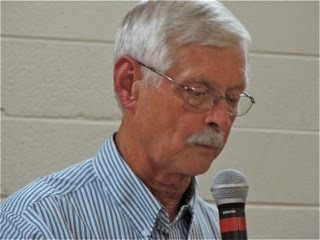 He described himself as a fiscal conservative and also of the need to implement the Organics Recycling program to save money. The program didn't provide an opportunity for any of the four-dozen audience members to ask questions, but the buzz around the room at the conclusion of the formal segment of the program seemed very positive. Folks seemed to have learned a lot from this process and were busily chatting away with the candidates. Costa Mesa Brief was on hand to film the festivities. I'm sure it will be up on their YouTube website soon. I didn't see them circulating like vultures this time, looking for "gotcha" moments, although the owner of the site engaged me in "spirited" conversation. It seems he doesn't like the way I do my thing, doesn't like what I write and is offended when I refer to him - even though every time I mention his work the hit counter on his site starts spinning. I encouraged him to NOT read what I write, but smiled that it bugged him so much. So, folks, that's it! No more candidate forums. From now until the election you will be deluged with stuff jammed into your mailboxes, exposed to the blight of campaign signs everywhere and have candidates and their minions knocking on your doors. It will soon be over, though. Early November 5th we'll have a good idea of what this city will look like politically for the next few years. Take a deep breath - we can to this! You will recall that I recently wrote about the confusing language on the ballot for Measure P, the advisory measure regarding the scheme to make some lanes on the I-405 Freeway from Costa Mesa to the Los Angeles County line into High Occupancy Toll (HOT) lanes, HERE. At the time I emphasized that the language on the ballot asked two (2) questions that were exact opposites, but you're given only one choice of an answer - YES or NO. Here's how it looks on the ballot. Since my earlier blog entry I have communicated several times with city officials - specifically, CEO Tom Hatch, City Attorney Tom Duarte and Communication Director Bill Lobdell. To date I have received NO direct reply to my requests. 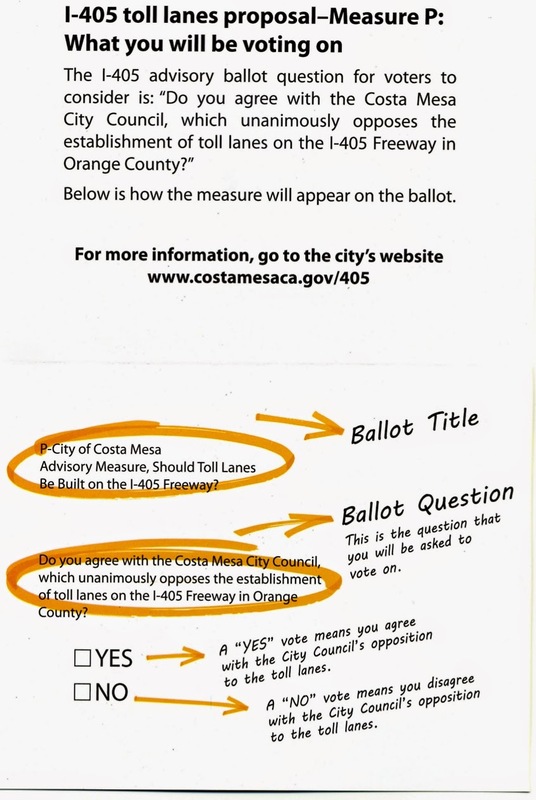 In an attempt to summarize the I-405 toll lane advisory measure in a short ballot title, City of Costa Mesa staff used wording and punctuation that could cause confusion among voters. For that, we apologize. We are reviewing the matter. Ultimately, as the City CEO, I take responsibility for the title’s lack of clarity and hope that it does not detract from the purpose of this advisory measure. 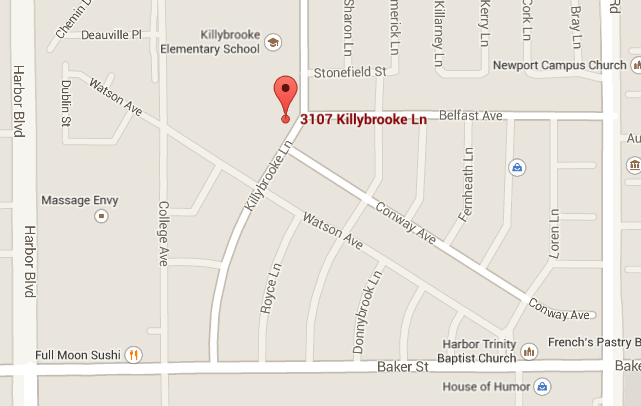 We are taking several steps to reduce any potential confusion. First, the city is sending three informational mailers about the ballot measure to each resident. The first mailer—which emphasizes the ballot question—has already been mailed. For the remaining two mailers, the city will also emphasize the ballot question—and point out the difference between the ballot title and ballot question—to reduce any potential confusion. The same material will also be featured on the city’s website and other media platforms. Of course, many of you will have already mailed in your absentee ballots and a goodly number of you may have marked it incorrectly as regards Measure P. Keep in mind that I don't care how you marked it as long as you understood what your answer meant. If you have not already marked your ballot, let me help you. I, personally, don't want to see CalTrans hijack our Measure M-funded expansion lanes on the I-405 and turn them into HOT lanes. So - follow me now - I'm voting YES on Measure P. That means I agree with the City Council in their opposition to the toll lanes. THE WHOLE THING IS UNNECESSARY! Perhaps the most unfortunate part of this debacle - aside from it being a major screw-up - is that the whole thing was unnecessary in the first place. Putting Measure P on the ballot - it cost at least $12,000 to do so and who knows how much more to distribute those "fix it" communications Hatch mentions above - is unnecessary because it's only an advisory item and has no strength of law, but it made a certain mayor who's running for re-election look firm and decisive. 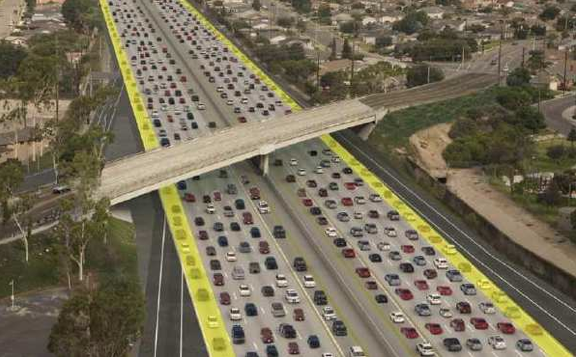 If it was designed to tell Governor Jerry Brown that we don't want the HOT lanes - that's the alleged purpose - and if it was really THAT important, somebody should have paid more attention to it. It wasn't really important, so they didn't. Too bad, because it makes the city look like a bunch of rubes who can't get their act together. 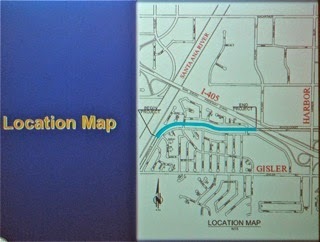 Last night, in the Costa Mesa City Council Chambers, a small group of residents heard from representatives of the Flood Control Design Section of the Orange County Public Works Department and City Staff about the plans for rehabilitation of a little over 3,000 linear feet of the Greenville-Banning Channel, which runs through Costa Mesa from the I-405 Freeway, across California Avenue to the Santa Ana River. We learned that this project is only one in a $2 billion dollar backlog in work for the Public Works Department - which might take 90 years to complete. The Flood Control group manages more than 370 miles of flood control channels throughout Orange County - more than the miles of roads the county manages. This project will require the replacement of the New Hampshire Avenue bridge in its entirety. The California Avenue bridge will be untouched. 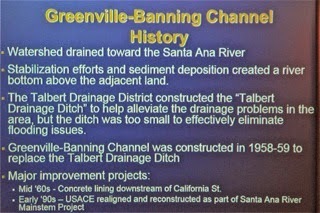 This project is necessary to rehabilitate a crumbling channel in which decades of erosion has taken its toll. The entire length will receive some kind of repair, which will be designed to manage that proverbial 100 year flood. 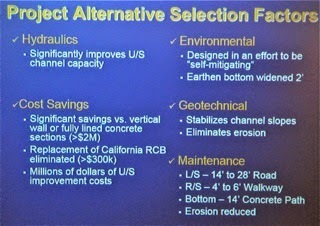 Many factors were considered when planning this project, as listed on the slide below. 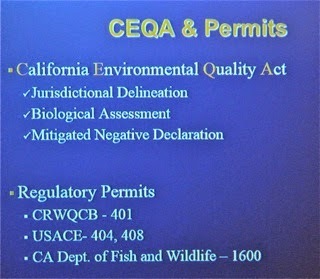 The permitting process is overwhelming, having to deal with many governmental entities. It is presumed that the permits might be obtained by December of this year. The schedule below shows the anticipated time table, with completion optimistically planned for the winter months next year. I thought it was interesting that when members of the public asked about community outreach the officials indicated that the contractor would be in touch with them. They made it clear that "issues" with the contruction during the process should be directed to the contractor. Clearly, the work needs to be done on that channel, which is certainly showing signs of possible failure if a large storm were to occur. Questions were asked about standing water - there shouldn't be any. That's an important issue since we hear more and more about mosquito-born illnesses lately. 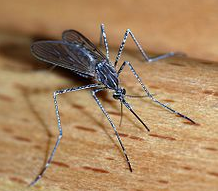 County Vector Control will handle that problem. The Friends of the Costa Mesa Libraries will host a Meet And Greet event Thursday, October 16, 2014 at which the voters will have a chance to spend some time with candidates for several special districts that serve Costa Mesa. The event, to be held at the Halecrest Swim and Tennis Club, 3107 Killybrooke Lane, will run from 7 - 9 p.m. and will be moderated by MESA Water District President Jim Fisler. For Costa Mesa Sanitary District Candidates - Residential Trash Rates, Consolidation and the Organics Program. There will be NO questions asked of ANY candidate from either the moderator or the audience. Following that portion of the meeting the candidates will adjourn to their tables and/or just mingle and answer any questions individual members of the audience might have. I'm told Barry Friedland and his Costa Mesa Brief crew will be on hand to provide a video record of this event.